Party girls have been soaking gummy bears in vodka for ages. 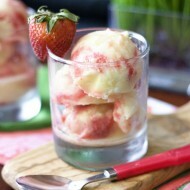 It’s like the cuter, gummier jello shot and makes a great party treat. 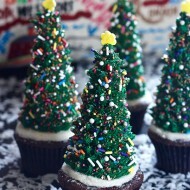 But putting them in champagne flutes topped with cupcakes and sprinkles? That’s taking it to a whole ‘nother level. I’m at that age when binge drinking has become increasingly less appropriate among my peers, but there’s occasions where the rules are stretched a bit, and bachelorette parties are definitely one of the exceptions. 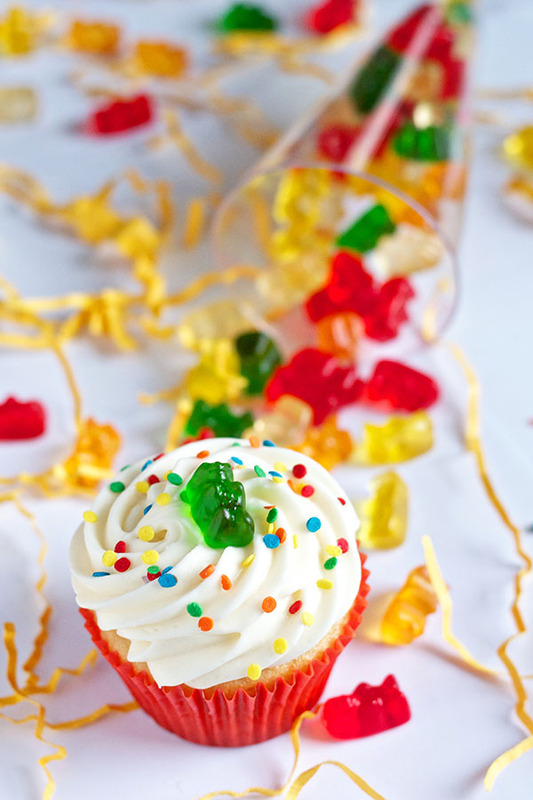 I love contributing fun desserts to my friends’ “last flings before their rings”, and these boozy gummy bear cupcakes were a big hit for my friend Ilana’s party last month. Her wedding was actually this past weekend, which was incredibly beautiful and a lot of fun, and I’m glad I could help celebrate the bride leading up to her big day the best way I know how – with sugary treats and alcohol! I must admit I’m surprised I haven’t posted something involving vodka-soaked gummy bears sooner. My friends and readers really seem to love boozy desserts (the Fireball Cupcake Jello Shots and Watermelon Jello Shots are two of my most popular posts – in the real world as well as the world wide web), so I’m very aware that alcohol + dessert is a very popular combination. The fact that I’m also obsessed with gummies makes it quite miraculous that this particular combo has taken four and a half years to show up here. The cupcakes themselves are nothing special – just funfetti boxed mix topped with whipped vanilla buttercream – although attempting some sort of fruity vodka center like Sprinkles Bakes did would be pretty amazing here. Standard muffin tin cupcakes fit perfectly inside plastic champagne flutes (I bought mine here), and they make for an awesome presentation for the boozy gummy bears. If you’re not headed to a bachelorette party like I was, you could totally just fill these with M&M’s or other colorful candy for a really cute dessert display. 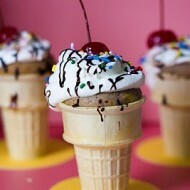 But don’t forget the sprinkles! 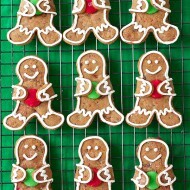 Here is a rough “recipe” for making these, but you can really be as creative as you want. 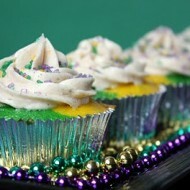 Change up the kind of cupcakes, frosting, decoration, even the type of candy if you’re skipping the vodka altogether. The combo of cupcakes and candy delivered together in one adorable glass is never a bad thing. Happy and safe boozy eating! 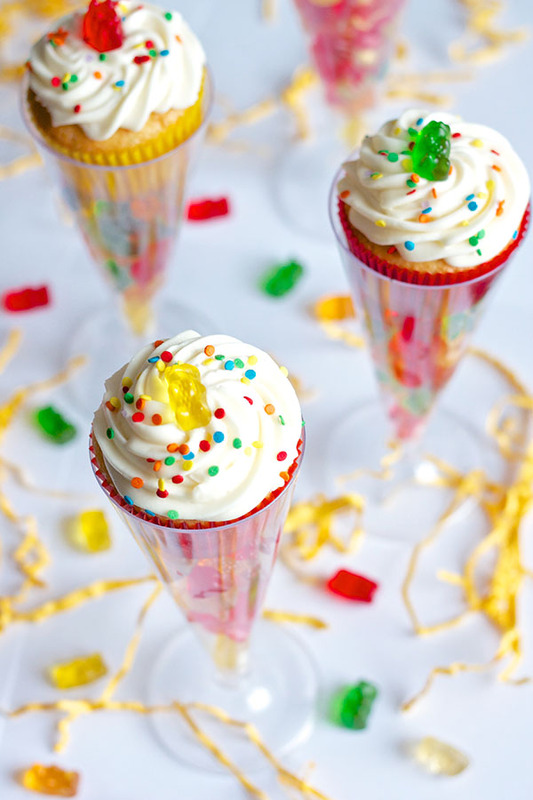 To prepare the boozy gummy bears, first measure out how much of the gummy bears you'll be using by filling up the champagne glasses to just below the level of a cupcake liner multiplied by how many glasses/cupcakes you'd like to make. 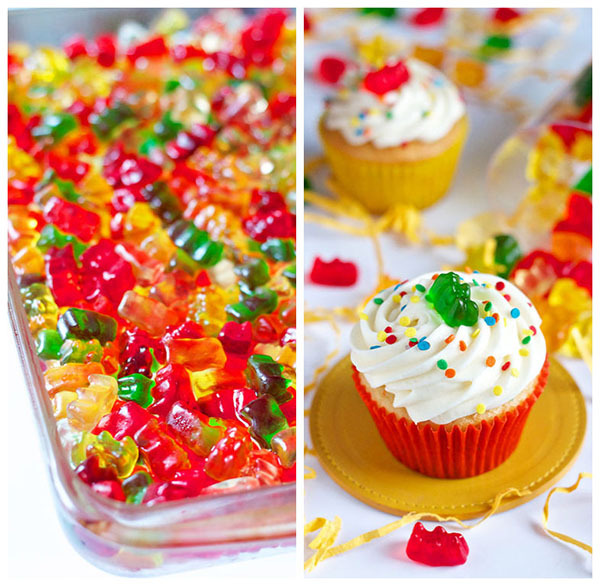 Transfer this amount of gummy bears to a large container, such as a 9x13" Pyrex pan, and spread into an even layer. Pour enough vodka over the gummy bears until they're just slightly but not totally submerged. Cover with plastic wrap and store in the fridge for a maximum of 24 hours. I stirred them up ever few hours to even out the distribution of vodka. When you're happy with the booziness of the gummies, drain the excess vodka and pat the gummy bears dry with paper towels. Transfer to another container and store in the fridge until ready to use. Prepare the cupcakes as directed and let them cool completely. 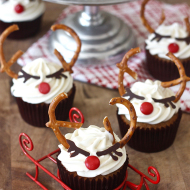 Frost with your batch of buttercream, decorate as desired and set aside. 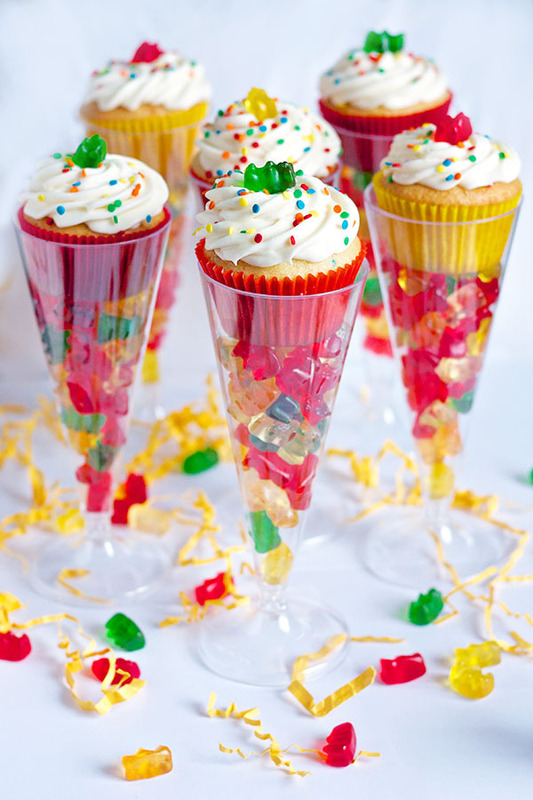 Fill the champagne glasses with the boozy gummy bears right up until the level that a cupcake will fit. 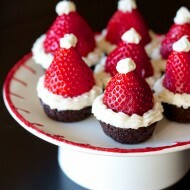 Load the cupcakes into the glasses, being gentle so they sit straight. 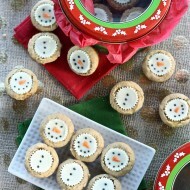 For other bachelorette-appropriate ideas, check out my Chocolate Kahlua Cake Push Pops, Sweet Tea and Vodka Lemonade Cupcakes, Champagne Jello Shots, or my entire page of Boozy Treats :) If the bride’s not into booze, try these Engagement Ring Cookie Butter Rice Krispie Treats or adorable Cookie Dough Stuffed Cake Pops! Yep, infused booze is just the way we roll at Bake It with Booze! I have a very large jar with the hinged lid that I use for infusions. Works great and seals nicely. I’ve found that it’s okay to leave out on the counter, even when I’ve infused with fruit. 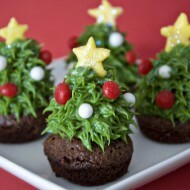 These cupcakes look SO fun…Shared them with our FB fans. Great recipe, Erica! Cheers!!! Thank you for your tutorial!!! I have been looking everywhere for what type of champagne flutes to use, and so far, you are the only one who has given a link to where you bought yours. Most of the plastic glasses I have found locally are too small for a regular sized cupcake. Some people have mentioned the Dollar Store, but I didn’t see a big enough flute in the store. Thanks again!!! Thank you for the link to the flutes. I’ve been working hard to find a champagne flute with an opening big enough for a cupcake! Thankyou for this awesome cute idea for a fun adult party!! Could you use the alcohol liquid from the steeped gummi bears in the buttercream to add a bit of a fruity/vodka kick to them??? Ohhh that’s a great idea!! About how many gummy bears per flute? Trying to figure out how many pounds I will need. I am ordering specific colors. Hmmm that much I don’t know, I’m sorry. I would say like 30?? Could you use no alcohol drink to soak gummy bears?